Units and Battle are probably the part of the game which went through the biggest change. On the day we decided to start working on the sequel, our first topic of discussion was “how are we going to make battle more interesting and bring more diversity to units?” After going through a couple of ideas we settled on one with the most promise. With your help, in the coming months, we hope to make it a unique and interesting mechanic. The core of the new system is moving from the simplistic calculation of “who has more power” towards actual battle, which in itself is also turn based. 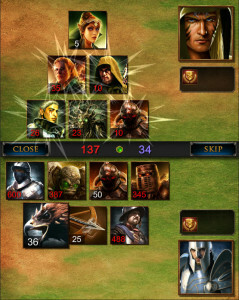 Victory in the new battle is determined by the number of points gained by each side. 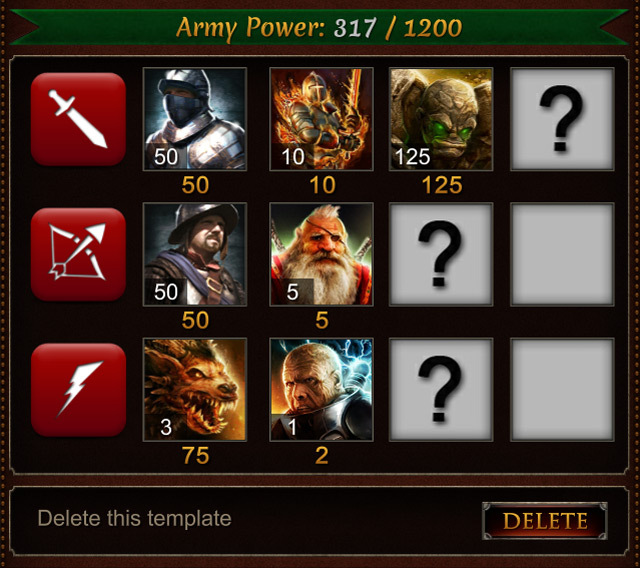 Those “battle points” are earned in various ways: certain buildings give defensive army a flat bonus, champion’s Armorer specialization will also bolster the score, however majority of the time the results of each clash of armies will be decided by the amount of hurt they can inflict on the opposing side. In order to go into more details on how battle points are calculated we have to start with units. Besides the already known from the original Dragon Lords characteristics of attack and defense, each unit has two additional attributes: initiative and power. Initiative is responsible for deciding the order in which units perform their attacks, the higher the initiative, the faster the unit can attack in the battle. Low initiative units usually are stronger, however before their turn to attack comes they are very likely to suffer losses from units with higher initiative. Power is essentially the amount of “space” this unit takes up in your army. Each kingdom has a limit of how big an army it can field in one battle, this limit is calculated based on the current land the kingdom owns (however it does not mean that a bigger kingdom will always have a bigger army, we will cover this scenario in a post dedicated to War). This limit is utilizing power, rather than amount of units. Initially you are only going to have basic soldiers, with the power of 1, however as more powerful forces join your cause, their power cost is going to grow. 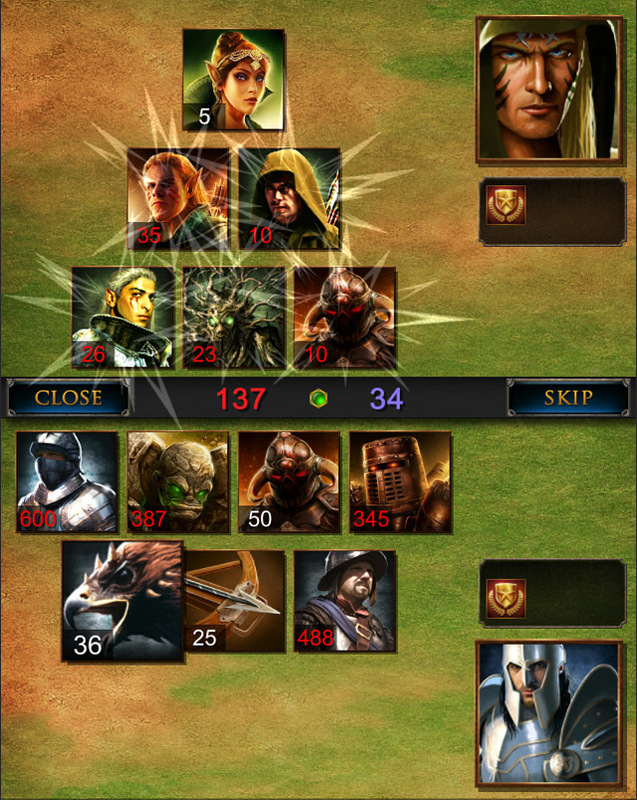 For instance, you will have to remove 100 soldiers in order to make room for one Dragon. Finally, each unit is assigned a “Type”, which establishes this unit’s position on the battlefield and its preferred target. We have three types: melee, which fights hand-to-hand with opposing army’s melee, ranged, which targets melee as well as ranged, and special units, which can do various things, based on their abilities. One very important thing when planning your army setup is the fact that melee units, if their attack is overwhelming, have the ability to break through the enemy melee lines, gaining an additional attack against either ranged or special units. So, while ranged units might have higher attack and initiative, it is critical to have them protected from enemy melee forces. Now that you know about units we can come back to battle calculation. The first step is establishing the order in which units are going to attack. We calculate the order of units participating in the battle, from highest to lowest initiative. When two units of opposing armies have the same initiative, the defending unit attacks first. The attack is spread across all units of the preferred target type (example: you have 100 grunts facing a manticore and stone elemental, the attack will be split against those two units 50/50). Casualties are being calculated basing on attacking units’ attack and defenders’ defense values. Only defending units suffer casualties in this step. The combined power of all eliminated units is added to attackers’ battle points. Luckily, not all units eliminated in the battle are actually dead. The ratio of fallen units to eliminated in the battle varies depending on several factors, which we will cover elsewhere. It is important to remember, that units marked as eliminated are not the units you see as lost in the battle event. This system will in essence work in a very similar way to the one we used in original Dragon Lords, as in: the stronger the army, the higher chance of victory, however in situations where kingdoms of equal size clash, army composition will play a significant role. This will also influence the flow of war, as between kingdoms of equal size, one might be better suited to attack specific targets in the opposing alliance, basing on their race, and through that – bonuses their units might get in that battle. Because of the maximum army limit you no longer have to put your entire population in army during the war. Holding a solid magical defense might prove critical in tipping the scales of victory, since even if enemies manage to break through your defense, each mage you have decreases the power of spells being cast on you. The limit also allows you to use different units in attack and defense without training soldiers back and forth, something that players did not like in the original game. 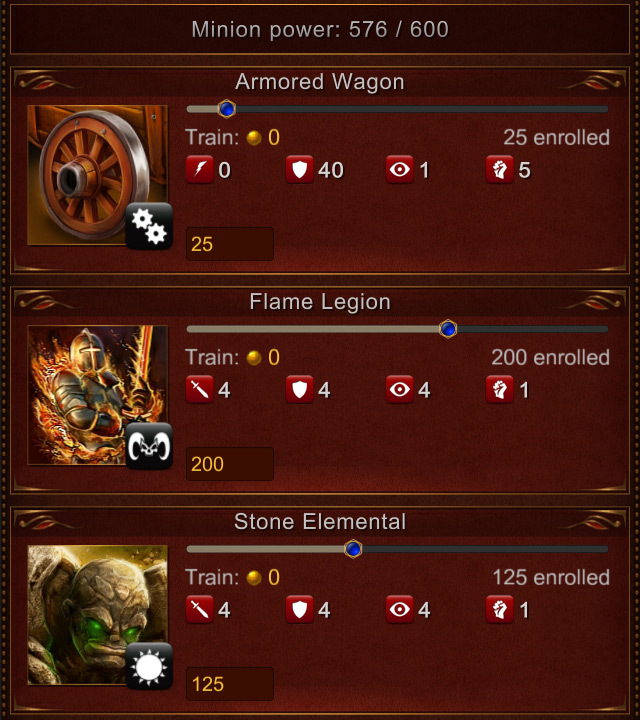 In Dragon Lords 2 you can create an offensive template with Siege Towers and Armored Wagons, while your defensive template will employ a contingent of Scrap Mechs and Boiling Tars. 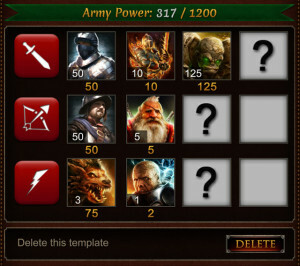 Army Templates are guidelines for the game which units you wish to use, however, as the situation in your kingdom changes while you are not playing (some units die, others are summoned/sent as reinforcements by your alliance mates), the game will automatically pick what units are available, to make sure your land is protected. Now that we have mentioned both Mechs and Engines it’s time to introduce the new way units are split. Your army consists of Soldiers trained out of your population, Minions created by alchemists and builders or summoned by mages; and hired Mercenaries. The last group consists of units you can hire at the Red Eagle Company, as well as any units sent to you by members of your Alliance. Both groups, Minions and Mercenaries have a limit, to prevent using them as your only source of military power, however they are going to be a very important tool in mounting successful military campaign. Military units can also be distinguished by their “race”. Each unit wears a “badge” indicating to which group it belongs. A helm signifies a soldier unit, trained from the population. Gears are the symbol of engines, constructs raised by builders. Sun symbol indicates elementals, while the demon head means – you probably guessed it – demons. 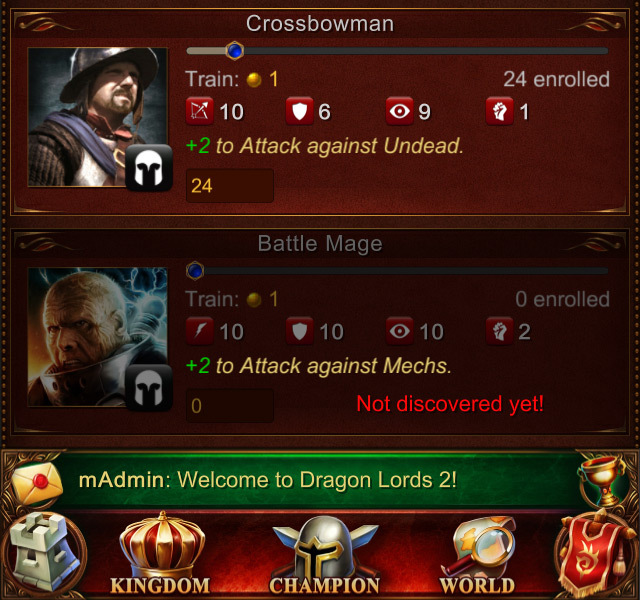 The last two groups are summoned by your mages. As we have hinted in the announcement post, each group of units will be susceptible to a specific spell. Plague, aside from targeting the general population, will reduce the number of soldiers, Banish will do away with demons, Conflagration will destroy Engines, Unbind will release elementals from under your control, while Overload will destroy mechs. On a final note we want to mention a couple of interesting things about the units. First, Engines (formerly known as Siege Engines) are constructed by builders, much like in the original Dragon Lords. 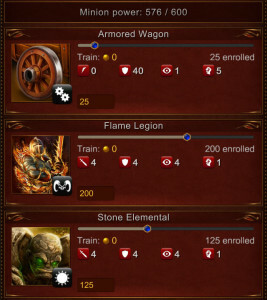 Their use has been extended with the addition of the new unit: Armored Wagon. This unit is not going to help you in battle, however only through the use of Wagons will you be able to steal opposing kingdom’s resources. The amounts of food, stone and mana carried away during attack are limited by the number of Wagons, which have survived the battle. 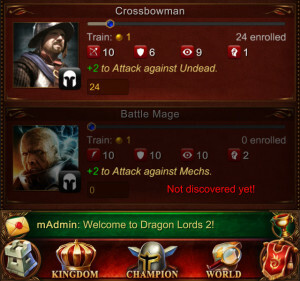 Finally we need to mention the group of units, which is completely new to Dragon Lords: Mechs. Those creatures created by a mixture of magic and engineering are brought to life in the Alchemy lab, a place where you scholars will spend a lot of time, after all discoveries have been completed. I think that’s enough info for today! New server is ready, Alpha testing will start this Sunday!